Yesterday I had my first experience with cocaine, spent some time at the hospital, and was given two injections of adrenaline. Does that sound bad? Just over a year ago, I noticed my nose was always stuffed up one one side or the other, 24 hours a day, but I didn’t feel like I had a cold. It got worse and I began having fairly frequent migraine-strength sinus headaches, and constant low-level headaches. I went to see an otolaryngologist (ear, nose, and throat specialist) who decided I have swollen turbinates, also known as nasal concha (click here to see what that means). The solution? Cauterize them! Yep, she decided to burn the inside of my nose, removing a small amount of tissue. The scar tissue should prevent the turbinates from swelling up in the future. Yesterday morning was my surgery date, and I showed up to the hospital fashionably late. Into the operating room we went, where the surgeon promptly rammed some liquid cocaine up each nostril. “It’s an extremely fast metabolizer,” she said. Some of it trickled down my throat which tasted DISGUSTING, but pretty soon I couldn’t feel it anyways. 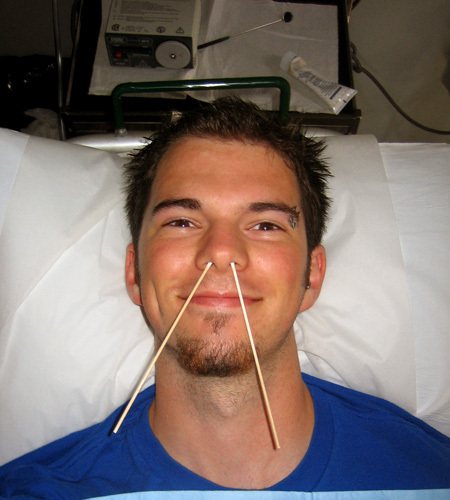 Then she gave me a small injection in each nostril, which I assumed was regular anaesthetic like at the dentist. My heart started beating like CRAZY and I was starting to wonder what was going on, when the assistant mentioned that those two injections were adrenaline and that my heart should be going crazy right about then. The painkillers only worked on the left side of my nose, and the burning laser hurt like HELL on the right side, but it was so quick (about 1 second, literally) that it was no worry. 15 minutes after walking into the room, I walked out and returned home to study for last night’s exam, which incidentally went fairly well. My nose has been filled with blood for the last while, but it doesn’t hurt or anything, and you can’t tell by looking at me, so I’m happy. I get to put polysporin up my nose thrice daily for the next month, oh happy day. This entry was posted in Canada, Humour, North America and tagged Lasers, Nose surgery.